Update 3/10/14: We’ve been talking to Google! Last week, we had the chance to speak with Ryan Germick, the Doodle Team leader and Megan Smith, a Vice President at Google. They were both incredibly inspiring and emphasized their commitment to more diversity not only in Google Doodles, but also Google as a company. They shared with us some of their newly implemented initiatives and even some plans for the future, and we talked about Google Doodles’ improvements so far this year. 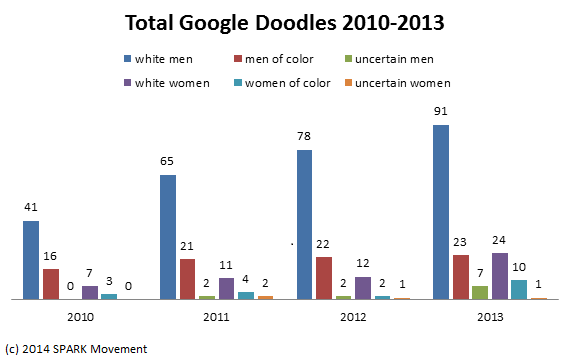 We’ve been keeping track of their 2014 Doodles and the gender and racial distributions seem to be 50/50. They told us they want to continue this trend! Moving forward, we’re incredibly excited to work with Google to raise the visibility of women and people of color’s contributions in public spaces. We’ll keep you updated as things develop–until then, keep sharing our data and submitting people you think deserve Doodles to our Tumblr! We learn history in all kinds of ways. In textbooks, classrooms, and museums, we learn the names of those who came before us to build the world we live in now. But we learn history in other places too: from monuments and statues to the names of streets and buildings, we’re constantly getting messages about who is important enough to remember. Another way we learn history? Google Doodles, those cute, fun animations and sketches that appear on Google homepages. Download our complete report (.pdf), which features data for every year 2010-2013 and goes into detail about our methodology. Read Speaking Up for Us, a project by science educator Ann M. Martin that features research on gender in Doodles stretching back to 2001. Read Celeste’s blog to learn more about why this action is so important. Visit our campaign Tumblr, This Could Be Google Doodles, where we’re showcasing historically underrepresented people who totally deserve to be honored with a Doodle. Submit your own historical hero! Research monuments, parks, buildings, and streets in your town–are any named for women? For people of color? Share what you find with people in your community. Share the below infographic (click for full size). There were zero women of color honored in a global Doodle (Doodles seen everywhere around the world) until 2013, when Ella Fitzgerald was featured. Although women make up more than 50% of the world’s population, they’ve made up only 17% of Google Doodles honoring people from 2010 to 2013. White people made up 91% of global Doodles and 74% of total Doodles honoring people from 2010 to 2013. 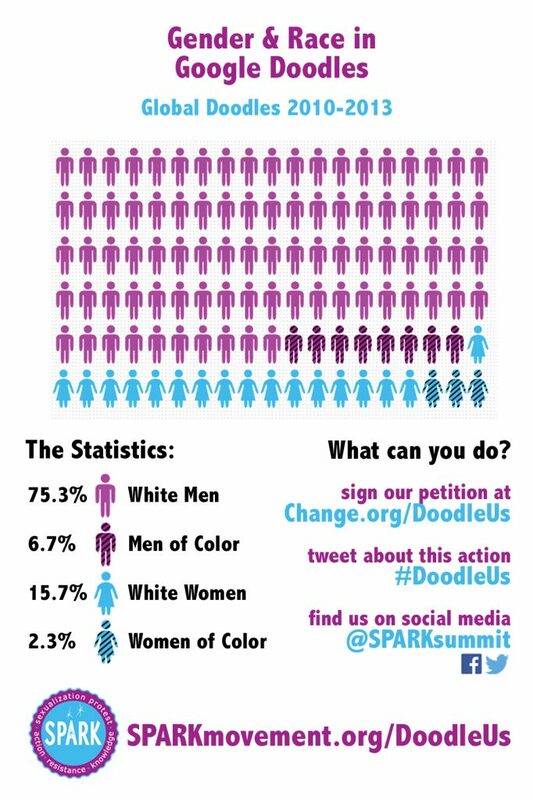 Of the 26% of Doodles honoring people of color, only 18% honored women of color–that’s only 4.3% of every Doodle honoring a person from 2010 to 2013. We want Google to correct this imbalance. We’re asking them to #DoodleUs–to get real about history and to stop contributing to the dangerous fiction that white men built and did everything worth remembering.